ERE graduates will be prepared to move to higher levels of their careers, across a variety of industries and sectors. They will gain access to a wider range of positions both in engineering companies and in national and international government agencies. Besides these traditional activities, in industrialized and rapidly evolving societies, the skills of Environmental Engineers are increasingly needed in the fields of territory planning and environmental conservation. Moreover, the rising demand for safety and protection against natural and industrial risks is the framework in which the skills of Environmental Engineers meet the continuously evolving needs of civil protection agencies. The Master’s gives access to third cycle studies (PhD/Specialisation schools) and to professional programmes. 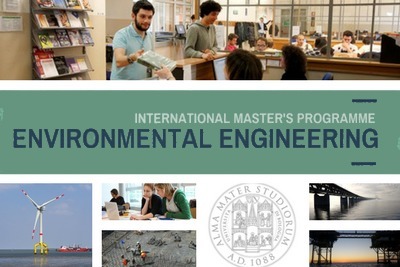 Call for applications for the Master's Degree Programme starting in September 2018: http://corsi.unibo.it/2cycle/EnvironmentalEngineering-ERE/Pages/call-for-applications-academic-year-201819.aspx Admission to the International Master’s in Environmental Engineering, ERE international curriculum requires a 1st cycle Italian degree or equivalent bachelor achieved at legally recognised Institutions in Italy or abroad. The Commission for the selection of candidates will evaluate the CVs considering both the relevancy of the exams taken during the studies and the working experience. Anyhow, it is expected that the students should already have a sound background in Maths, Physics, Chemistry and in the basic engineering disciplines, in order to be ready to successfully follow the courses offered in the Master program. For Non-EU citizens, an annual quota of places is set each year by the University of Bologna. For the Master Degree in Environmental Engineering, ERE international curriculum, in the academic year 2018/2019, a maximum of 40 non-EU students will be accepted. Please note: no entrance exam nor Italian proficiency test are required for the Master’s Degree Programme in Environmental Engineering. All activities are in English. The master’s duration is two years: core modules (1st year), common for all students, aim at consolidating fundamentals and improving capabilities in the areas of Environmental Engineering; in the 2nd year students can focus on “Environment, resources and circular economy”: material and energy flows through industrial systems and connections between operators within the “industrial ecosystem” will be tackled from a systemic point of view. Whilst looking at their global impact from the outset, the programme will focus on: Earth resources management; Sustainable development; Resource efficiency and resource savings; Rational exploitation of oil and gas reservoirs; Water resources; Pollution prevention; Waste prevention; recycling; waste and bio-waste valorisation; Reclamation and health. Environmental engineering will be at the heart of any transition to a circular economy. Equally crucial will be the skill of understanding how individual activities interact within a bigger, interconnected world.